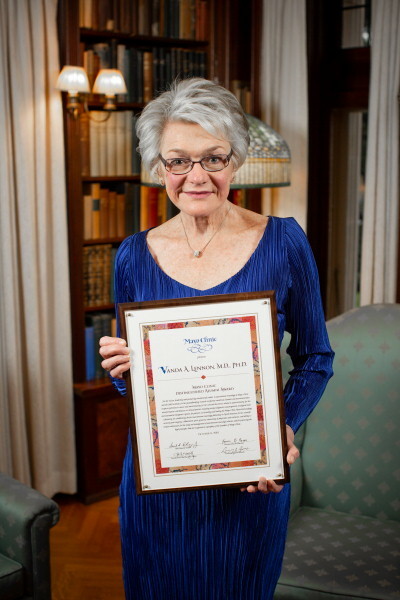 Vanda Lennon, M.D., Ph.D., recently received the 2018 Mayo Distinguished Alumni Award. The award acknowledges and shows appreciation for the exceptional contributions made by Mayo Clinic alumni to the field of medicine. The award was established in 1981 by the Mayo Clinic Board of Trustees. 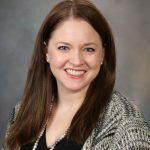 Dr. Lennon is a Consultant in the Division of Clinical Biochemistry and Immunology, Department of Laboratory Medicine and Pathology with joint appointments in the Department of Immunology and the Department of Neurology. She holds the academic rank of Professor of Immunology and Neurology at Mayo Clinic. Dr. Lennon has been recognized for her leadership and pioneering research in autoimmune neurology at Mayo Clinic. Her research specialties include plasma membrane channels and neurotransmitter receptors and autoimmunity afflicting the neuromuscular junction, somatic, and autonomic nerves, and the enteric and central nervous systems. On the clinical side, Dr. Lennon has provided unique diagnostic tools and innovative therapeutic options for patients afflicted with autoimmune neurologic disorders and cancer. In addition to her research and clinical contributions, Dr. Lennon founded and leads the Neuroimmunology Laboratory. Under her leadership, she has established the first Autoimmune Neurology Fellowship Program in North America.